Thanks to Twyla for this idea (and link)! 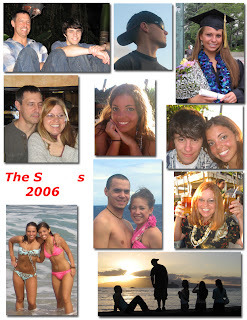 I took a few of my favorite photos from each month of 2006 (they appear chronologically) and put them together. Maybe THIS should have been our cyber-holiday-card! ... but I've been on vacation and have felt significantly less cerebral for the past few weeks! Next week I'm sure I'll have more poignant observations and more interesting things to say -- especially since I'll start my new job on Tuesday. It was a beautiful, classy wedding that began with the bishop just casually talking about marriage and how it changes over the years. As he spoke, you could see couples our age (those married over 20 years) scootch slightly closer together or gently put an arm around a spouse's shoulder. "Love will likely change slowly throughout your marriage," he told Tara and Ryan, "from the head-over-heels love you feel now to a more mellow, more mature, but in many ways, a deeper love..." How true. I didn't like being 50 today. I'll admit a little-known fact about me: I was a BIG flirt in my youth (much like my daughters are now) and it was odd for me to think that I'm really too old to be flirting any more with anyone but my husband (which I still do). But even without the flirting (or much of it, anyway! ), I so enjoyed dancing -- to mostly 70's music, oddly enough -- and visiting and yes, even sipping a few glasses of champagne -- which helped to make the dancing really, really fun! 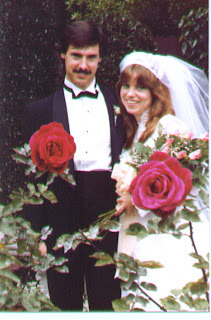 I love weddings because they make me think back to our own Big Day waaaay back in 1983. It really was one of the best days of my life -- so happy and so filled with love and hope and joy! And yes, love DOES change, but in many ways it's gotten better. Hmmmm... I wonder what deep revelation or inner meaning our refrigerator reveals?! Happy holidays from our family to yours! I usually get our holiday cards out during the first week in December, but not this year! And I usually write a silly poem to accompany the collage, but I'm not sure yet if that will happen this year... I'm still awaiting inspiration! The next week will be busy for sure, with my mother- and brother-in-law arriving for a week's visit tomorrow, cooking a traditional German sauerbraten and kaese spaetzle dinner the next day (we look forward to it all year! ), Elisabeth's best friend's wedding on the 30th (yes, she's far too young to get married), one scrapbook to finish (my MIL's) and one to start (Hawaii)... and preparations for beginning my new job after that. But of course I'll always find time to blog! 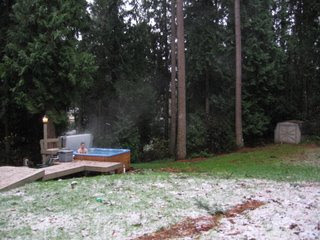 I am enveloped in the peace and quiet of Christmas morning -- and loving it. Whereas when the kids were young, this morning was filled with excitement and activity (and I loved that too), these days Christmas morning tends to be quiet and relaxed. I anticipate that, after last night, everyone will sleep in fairly late. Except me; I can never sleep in. Sometimes it's a curse! We arrived home in the early evening of the 22nd, exhausted after 24 hours of travel (we might as well have gone to Europe!) and -- in my case -- food poisoned! Turns out I had eaten some bad cream cheese at Starbuck's and I spent the night whining and writhing on the floor in the bathroom. It was a MOST unpleasant experience! I had no choice but to bounce back quickly though because we had ONE day to prepare for Christmas -- which we celebrate on the 24th. Those preparations included storm-related tasks, like removing rotten food from the fridge and freezer. (Amazingly, most of it was still good!) We battled crowds to do some very-last-minute shopping and to buy a tree, then came home and started decorating! It's the smallest tree we've ever had in this house because we inherited the piano this year, but I think it actually looks good -- and the cats love it! Eva, our AFS exchange student from Koeln joined us to make some last-minute cookies and for our traditional German Christmas Eve "bescherung," and we all had a wonderful time, with much laughter, good food (Mom's traditional Bavarian fare) and great company. Sunrise: Check. Sunset: Check. Ocean Sail: Check. Tomorrow night we'll board a plane heading back to Seattle (via LA) where we apparently STILL don't have power! Our poor neighbors have been enduring both a freeze and a power outage since the day we arrived in Maui eight days ago! How strange it'll be to go from warm, sunny, glorious weather to freezing cold, dismal weather and no power! But it'll be great to see our pets... and yes, eight days of togetherness will be too much. I think I'm driving my very independent kids nuts!? We got up at 4 AM this morning and drove from sea level to the 10,000 foot summit of the Haleakala volcano in a matter of an hour and a half. We'd heard that watching the sun rise from Haleakala can be a spiritual experience -- and if it weren't for the 200 other people awaiting said spiritual experience, it might have been. In any case, it was beautiful! And once the sun rose, we could see the baren landscape of a volcano's crater! Incredible! Instead of heading back to the condo like sane tourists, we split in three different directions once we returned to sea level. Peter and Danelle rented scooters and explored West Maui. Elisabeth, Kat and Aleks headed for Big Beach (where we were rained out earlier in the week). Tom (who celebrates his 51st birthday today) and I went out to lunch at Bubba Gumps, walked around Lahaina (the banyan tree, which fills up one full city block, is amazing! ), and thoroughly enjoyed an afternoon sail on the America's Cup II, which we wanted to do last time we were here, but it was cancelled. I grew up on sailboats in the San Francisco Bay, so this was definitely familiar territory! The best part of the excursion, though, was something I couldn't catch on "film" (no, I was able to document the captain's chiseled bod! ): a whale, fully breeching out of the water in a magestic jump, very close to the sailboat!! And he happened to be right in that streak of soon-to-be-setting sunlight that lay across the water in front of our boat! Now THAT was a spiritual experience! We then all met up in Lahaina, where I had some major holiday shopping to do, but got diverted by the second amazing sun event of the day -- sunset from Lahaina! I never got much shopping done, though, because others wanted to get back to the condo. Yup -- too much togetherness! But really, we're doing just fine... still laughing and enjoying ourselves, for the most part. So now for the sad part -- packing for the trip home. We need to be out of the condo by 11 AM, but our flights (yes, Danelle is flying separately again, but she's on a straight shot to Seattle) don't take off till almost 12 hours later. Thanks for "sharing" our trip with us, whoever you all are! I hope it hasn't been boring for you. I'll get back to those other boring posts soon... though first I might have some rather interesting storm and holiday posts! With some of us leaving Black Rock Beach with sunburns yesterday, we decided that today would be a do/go-as-you-please day. Tom and Peter explored the big waves (or what should have been big waves, but turned out to be wimpy waves) on the north side of the island, Elisabeth, Kat and I spent most of the day by the pool, Danelle relaxed mostly in the shade of the condo, and Aleks kinda made the rounds. It's important to have a day like this, I think, when seven otherwise-independent people are thrown together 24 hours a day for 9 days. Aleks might be relegated to the sofa sleeper, but he definitely has the best view! I took this picture before he woke up this morning. Whale watching is big on Maui in December, especially where our condo is, but we have yet to see any. Now that we're beyond the halfway point in our vacation (sob! ), we have to start thinking about finishing off all the food we bought when we first arrived. I wonder if everyone goes crazy with tropical fruit. We definitely stocked up on it -- so much so that I had to make a big fruit salad for breakfast. It was heavenly! Relaxing by (and in) the pool was wonderful. I had a chance to finally really get into the book I brought... joined briefly by a tropic (definitely not a Northwest) ladybug. We'll grill dinner by the beach tonight, then go to bed early, since we'll get up around 4 AM to travel to the top of Haleakala volcano to watch the sunrise. You can bet there will be photos of that! OK, it's not that sudden -- more "persistent." As we sat waiting for the botched flight to leave Seattle, I made the call and accepted the job offer! I'll post more about the job after I have a chance to absorb it all, but it's basically perfect for me, encompassing everything I want in a job! I've never hired and managed so many people before, nor have I established and run an entire office... but I'm up for it and hopefully I'll be good at it. I'll start work on January 2nd, but I'll work at home for the first two weeks while the office space (apparently my office has views of the Space Needle, EMP and the Puget Sound!) is being established. As much as I love my career, I must admit that Tom and I have pondered ways to stay in Hawaii. He keeps mentioning "Carolita's Fish Tacos." Hmmmm... sounds better and better with each mai-tai on the lanai, snorkeling adventure, and late-night warm ocean beach walk! It'll be hard to go back -- EVEN to something as exciting as this new position. The day began with a sunrise that looked very much like a sunset! Turns out it was sugar cane fields burning -- which is apparently a regular occurance on Maui! We then took off for a day at Ka'anapali Beach where we did some boogie boarding and snorkeling. More than once, we reminded each other that it's DECEMBER... and that our neighborhood is still without power, five days after the worst windstorm in recent Pacific Northwest history! It's 45 degrees in our house... poor animals! And the forecast is that it might even be a few more days before our neighborhood -- which is both fairly rural and in one of the hardest-hit areas -- has electricity. I asked Tom to "put his arm around his daughter." What a goof-ball! In the evening, it was off to the Drums of the Pacific Luau at the Hyatt Regency -- where the drinks just kept flowing! It was entertaining (especially the fire dancer! ), but it didn't compare to the Old Lahaina Luau, which Tom and I saw in 2002. That was much less commercial and seemed to be more authentic. Still, some of those bodies... niiiice! When they offered hula lessons on stage, Danelle, Elisabeth and Kat decided to give it a try (fourth, third and second from right). Danelle, being part Hawaiian, definitely looked like a natural. What fun! Tomorrow we'll head for the North Side beaches again and then into Kahalui. Hopefully the power will be on again in Seattle so we can stop feeling so dang guilty about this glorious (and I mean GLORIOUS!) weather! Where else does outdoors just sort of "flow" into indoors? Some buildings have only a roof... no doors or windows. With the temperature around 72 - 79 degrees year-round, why bother?! Too tired to write much of a narrative, but suffice it to say that these 37 coastal miles define "paradise"! I should also mention that a mini-van is too small for seven of us -- and that we've had entirely too much togetherness... so tomorrow we'll all just spread out for a beach day, then come together again for a LUAU! A bamboo forest (with a family we met there). Ke'anae Point. "Three Bears" falls. Hamoa Beach. Black Sand Beach.